Taking a break from our usual format, The Bad Doctor reads the paper. Hilarity ensues. No one is more surprised than me, but you can now subscribe to a podcast of these episodes on iTunes. Shocking, I know. You get what you pay for. Now scram! 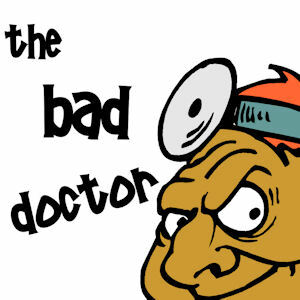 You can subscribe to a podcast of every single episode of The Bad Doctor on iTunes. I wouldn't, but you can. Want to like me on Facebook? What’s wrong with you?? You want to follow The Bad Doctor? Doesn't sound wise. Enter your email address to follow this blog and receive notifications of new posts by email-- really, best if you ignore those.